In a competitive job market, any little edge you possess can be the one that counts. As an Agile project manager, or an Agile professional who would like to move toward project management as a career goal, one such edge is the Project Management Institute Agile Certified Practitioner certification (PMI-ACP)®. Why should YOU take the (PMI-ACP)®? As you can see from the list of requirements above, the (PMI-ACP)® is not for Agile beginners. It is designed to build upon extensive experience and training in Agile project management. Therefore, the ideal candidate will already be using Agile methodology to manage projects, or will have been involved in Agile projects previously. You do not have to be working as a project manager. 1. Credibility: For a professional who already possesses the knowledge and experience required, the (PMI-ACP)® certification offers the confirmation of a neutral third party, adding credibility to any claims you make on a resume or job application. 2. 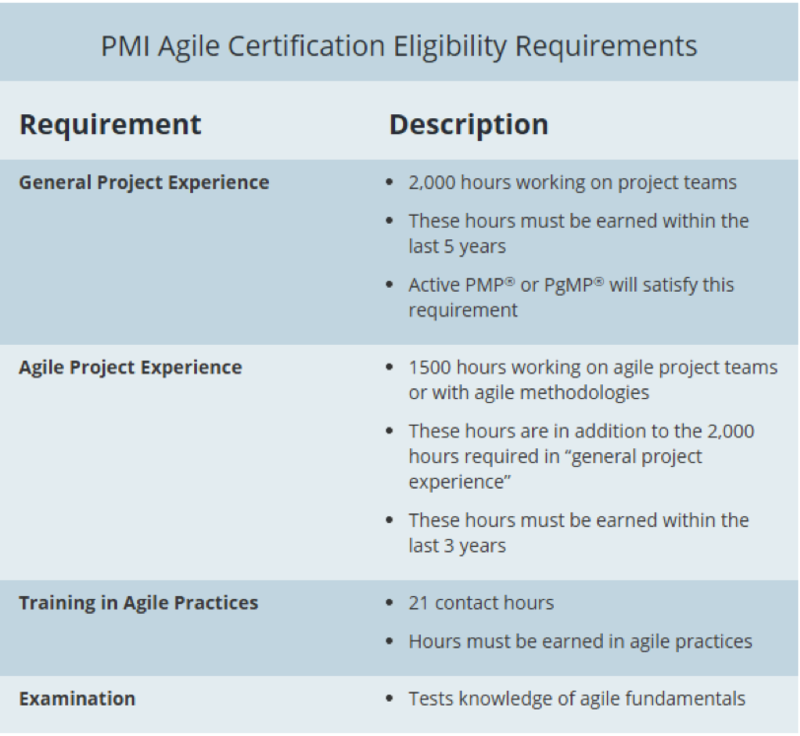 Expanded knowledge: For an up-and-coming Agile professional who is seeking career advancement, the training and experience necessary to pass the (PMI-ACP)® certification test can do wonders for increasing your knowledge and understanding of how Agile is applied and practiced. 3. Practical demonstration: In a circumstance where you know you’re ready to take on a more challenging roll in your current organization, but upper management is slow to make a move, earning the (PMI-ACP)® certification could be just what is needed to demonstrate your level of experience and knowledge, and therefore your aptitude for that new position. The most effective way to prepare for the certification exam is to take a prep class. (PMI-ACP)®, PMBOK® Guide, and PMI® are registered marks of the Project Management Institute, Inc.